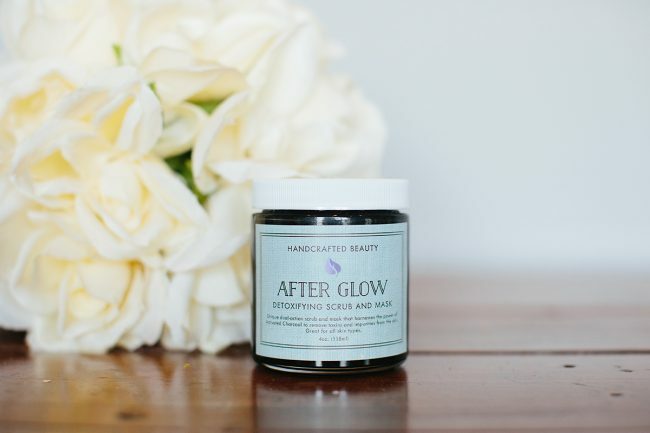 After Glow uses the power of activated charcoal and clay powder, to draw impurities to the surface of the skin, while the sugar gently exfoliates it away. Our skin takes a beating, constant exposure to a variety of toxins, sun and pollutants can damage the DNA of healthy cells, leading to premature aging, acne, and dull, lifeless skin. After Glow uses the power of activated charcoal and clay powder, to draw impurities to the surface of the skin, while the sugar gently exfoliates it away. A blend of Fruit and Nut Oils along with Essential Oils has been added to stimulate blood flow, brighten skin, hydrate, and replenish lost nutrients. You will love how skin tingling clean and refreshed your skin will look and feel. It is a GLOW that is absolutely undeniable. After cleansing, apply a generous amount to face and neck, avoiding eyes and mouth. Scrub in a circular motion removing dull skin. After exfoliating, allow product to stay on skin an additional 1-2 minutes. For best results use 2-3 times per week. Follow with Rose Water Toner & Daily Moisturizing Oil. Organic Castile Soap: A pure vegetable oil based soap that does not contain harsh chemicals or detergents. Gently cleanses and conditions the skin, while removing dirt and impurities. Organic Coconut Oil: Rich in Proteins and fatty acids, coconut oil contributes to cellular health and tissue repair. Long known for its antimicrobial and disinfectant properties yet gentle enough for all skin types. Sweet Almond Oil– Full of essential fatty acids, this oil delivers long lasting hydration without clogging pores. Known to firm and tighten the skin. Activated Charcoal: Known for its ability to absorb 100-200 times its weight in impurities, Activated Charcoal is a magnet for toxins, and brightens dull skin. Bentonite Clay: Known for its ability to draw out toxins, this clay also contains an abundance of minerals and vitamins allowing cells to receive more oxygen. Peppermint Essential Oil: Antiseptic and Antimicrobial properties help eliminate bacteria and soothe skin. A natural brightener, peppermint is also effective in increasing blood flow. Wintergreen Oil: Known for its ability to contact muscle tissue and blood vessles, which firms and tightens the skin. Also increases blood flow and aids in cell renewal. Tea Tree Oil: Helps to prevent acne and kills germs naturally. Tea tree oil is also beneficial for those with minor skin ailments. This product is just great! I love how clean and fresh my skin feels after it is done. I use it 2-3 times a week and my skin with using this whole line just feels better! Love how my skin feels after I use this! I use it every other day in my nighttime routine and I always feel so fresh and clean. I just can’t say enough good things about this whole line! It’s changed my life! Love this stuff! Use 1-2 times a week and my skins feels great afterwards! I LOVE this! It’s by far the best scrub I’ve ever used. It makes my face feel fresh, tingly, and smooth. And it really does make me glowy!